The BD Accuri™ C6 makes the analytical power of flow cytometry more accessible with ease-of-use and affordability. Its compact footprint and portable weight make it a valuable personal use tool for both novice and experienced researchers who want a cytometer to be easily available when and where they need it. 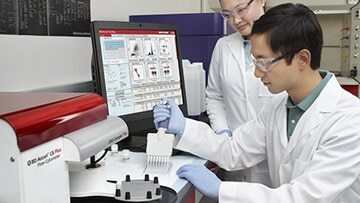 The system features an intuitive software interface, software templates, and reagent kits that guide users new to flow cytometry through workflows for popular applications.